Coal miners in the early 20th century risked their lives just to go to work every day. In the first decade of the 20th century, around a half-dozen miners died on the job every month in the coal mines of northern Illinois. Nationwide, more than 2000 coal miners died on the job every year between 1905 and 1930. But the workers at Cherry Mine in Cherry, Illinois, which included some underage workers as young as 10, never expected a disaster on the scale of the 1909 fire that killed 259 miners. Cherry Mine, which was operated by The St. Paul Coal Company, opened in 1905 and was producing 300,000 tons of coal annually just four years later. The mine consisted of three veins of coal, two of which were being mined in 1909; each day, approximately 300 men went to work on the second vein and another 200 on the third and deepest vein. The mine was state-of-the-art for the time. It had two vertical shafts: One, the escapement shaft, had steps and a fan to blow fresh air into the mine; the other, the main shaft, had two cages that lowered men and supplies down and carried coal out—but only to the second level. To reach the third level, miners had to walk to the escapement shaft and take a different cage to the third level. Though the mine was equipped with electric lights for safety, by November 1909, the electrical system had not been working for some weeks, and old-fashioned kerosene torches were attached to the mine walls for light. Just after lunch on Saturday, November 13, a wagon carrying six bales of hay for the underground mules was lowered into the mine.At some point during the transportation from the main shaft to the escapement shaft, it’s believed that the hay was left too close to one of the kerosene torches and was ignited—but the fire was small, and the miners thought they could control it. Some passing by to catch the 1:30 cage out thought so little of the danger that they didn’t even mention the fire when they reached the surface. Miners tried to dampen the fire with water from the mule stable, but they couldn’t see because of the smoke, and when they attempted to lower the wagon to the third level, where there was a water hose used to wash off the mules, it got stuck in the cage. They eventually dumped the wagon with the burning hay down the air shaft. It was easily extinguished on the third level—but during the hour or so of firefighting on the second level, the wind from the air shaft had fanned the flames until the wooden supports on the second level were ignited. When miners on the third level noticed the air quality falling, they called for the cage and got no response. They climbed the ladder to the second level and found the cage station abandoned and the passageway on fire. The fan at the surface then had been reversed, and was now drawing air out of the mine in an attempt to suffocate the flame. A few men were able to climb the escapement shaft ladder to the second level, but the ladder was on fire above them, due to the fan that was now sucking air upward. The miners on the third level rushed to the main shaft. The main shaft only lowered a cage to the second level, but there was a fairly new emergency cage installed between the second and third levels. It had yet to be put into operation, and no one knows for sure if it had ever been attached to the hoisting equipment. The cage brought dozens of miners up to the surface from the second level, but many more were succumbing to smoke inhalation and lack of oxygen in the mine. A dozen Cherry residents, some with relatives below ground, volunteered to go down and help the miners out. They alternated on trips down in order to bring as many men up as possible in each lift, making seven trips down. On the last mission, the cage operator received nonsensical signals from below. He hesitated, not sure what to do. When the cage was finally lifted up, all 12 men aboard were dead. There were no more rescue trips. That evening, the two shafts were closed. There were 280 men still below ground, but no one knew if any of them were alive. Once a day, the openings were checked, but the fire raged on. By Wednesday, one person was able to enter the mine wearing heavy equipment, and on Thursday, firefighters entered to try to extinguish the remaining flames. Then emergency workers spent several days bringing up the dead. On Sunday, a day after the blaze began, the men built a wall between themselves and the fire—but the air was getting worse. They knew that if the fire didn’t reach them, they could still die from “black damp,” a combination of nitrogen, carbon dioxide, and water vapor, the unbreathable mixture left over when the air’s oxygen is depleted. Eddy and Waite, the leaders of the group, ventured out to check the fire and were forced back. On the third such trip, they encountered black damp, which told them that the mine had been sealed. The kerosene lights gave out, and there were only the small carbide lanterns left. The men sealed up the last of the wall, leaving them in an enclosed passageway between 300 and 500 feet long. They wrote letters to their families as they waited. They found a spot where water trickled into the chamber, and made a small reservoir to collect it. By Tuesday, the carbide lamps refused to burn in the deteriorating atmosphere. By Thursday, the water was almost depleted, and Eddy assigned a guard to make sure no one took more than their share. The water then replenished itself. Some of the men started talking to themselves in gibberish. They all grew weaker. On Saturday, November 20, a week after the fire began, the miners partially breached the wall and discovered that the air beyond it was a little fresher, indicating that the shafts were open. The strongest of the men left the chamber in two groups of four at a time. A few hours later, a signal of two whistles was heard, meaning the men had found good air further out in the mine. 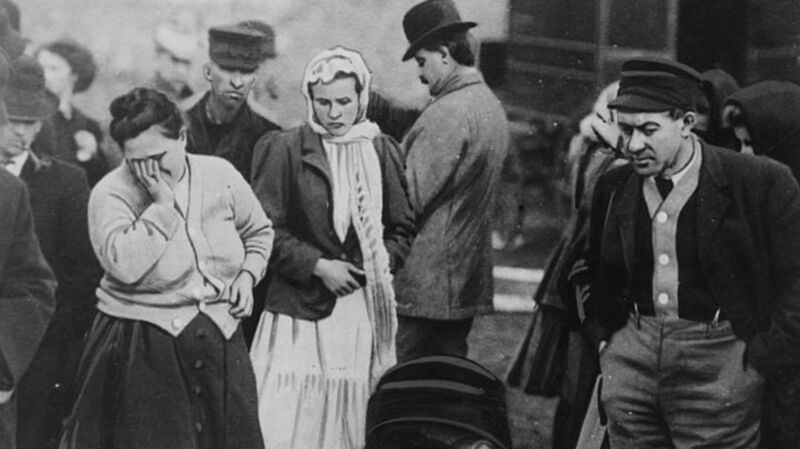 At about the same time, the wandering miners ran into recovery workers. All 21 men were removed from the mine alive—several had to be carried out—but the oldest, Daniel Holafick, was unconscious by the day of the rescue, and died a couple of days later. The news of the survivors spurred more rescue attempts, even as firefighters continued to battle the burning areas of the mine. No more were found. Eleven days after the fire began, it was determined that the coal seam itself was burning, and the mine was sealed once again. It wasn’t reopened until February 1910, when the temperature underground had finally stabilized. Around 160 women were widowed by the disaster, and around 400 children were left without financial support. An investigation determined that the Cherry Mine had employed at least nine boys below the age of 16, a violation of the law, and four of them died in the disaster. The St. Paul Mining Company was fined $630 for violating child labor laws, and was compelled to pay the families of the dead $1800 each. The public was appalled at the low amount, and raised another $1800 for each family through private donations. In the wake of the tragedy, new federal safety standards for mines were established, and the United Mine Workers gained hundreds of new members. A campaign was started that eventually led to the Illinois Workmen's Compensation Act.